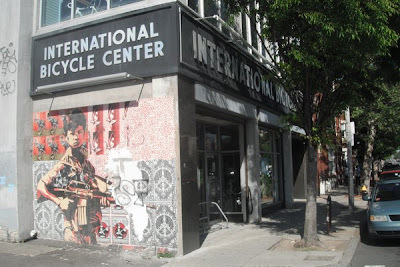 We wanted to go to Boston to visit the International Bike Center where I had been a few years ago and was awed by the size and scope of the place. Two floors of bikes and bike gear was like Nirvana for me. David said, "Nah, I'll pass". I saw David a couple of days later and suggested we go for a hike in the Blue Hills near Boston. "I'd love to" he said. "That would be swell". "After the hike we are going into the city to look at bikes at International Bike Shop. Is that OK with you? " "Sure, I have nothing going on Sunday", said David. I had gained a few pounds over the winter and was worried how I would handle the hills during the hike. It all worked out just fine. The bike shop was disappointing. It wasn't as big as I remembered and the selection was limited to Trek bikes and a couple of very high end professional bikes, one was on sale for $14,000. In the future we will stick to REI in Cranston R.I. and Travis Bike in Taunton, MA. REI has a much better selection and the prices are much better that International. Most of the trail was free of snow but not dogs. The trail got steep in places. I bought my bike at International back in 1984 while living in Quincy.It's the same bike I still ride today with upgrades to the components through the years. It's Not Only About Biking.